With our dental work in Mexico wrapped up, we immediately got back into travel mode, driving 600 miles in two days (with an overnight stop in nice cool Flagstaff Arizona) to reach Cortez in southwest Colorado. The area was in the midst of a heat wave, but 95° still felt so much nicer than 115°! Exploring the the Escalante Pueblo. 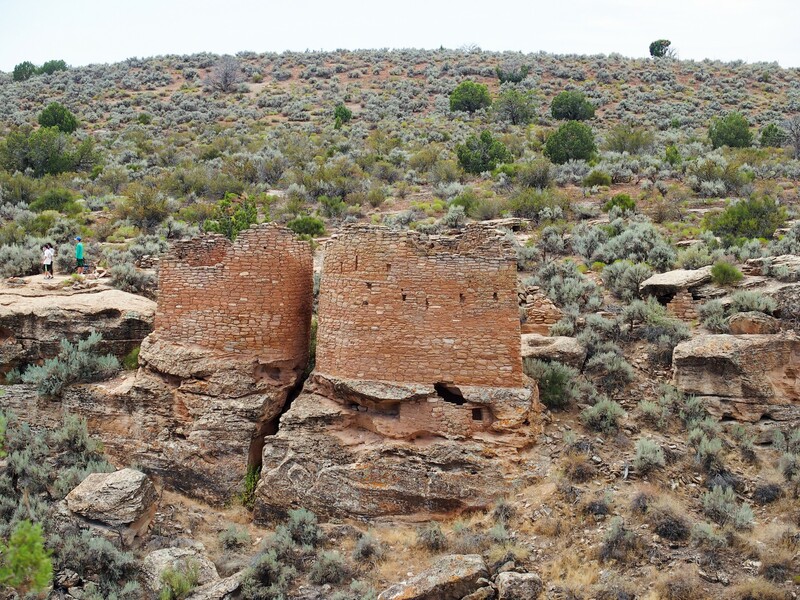 Cortez is a small town that’s centrally located to explore many nearby archaeological sites. We started out easy, with a short drive to the Anasazi Heritage Center. The museum is a great place to get oriented on the ancient Pueblo culture and archaeological excavations. 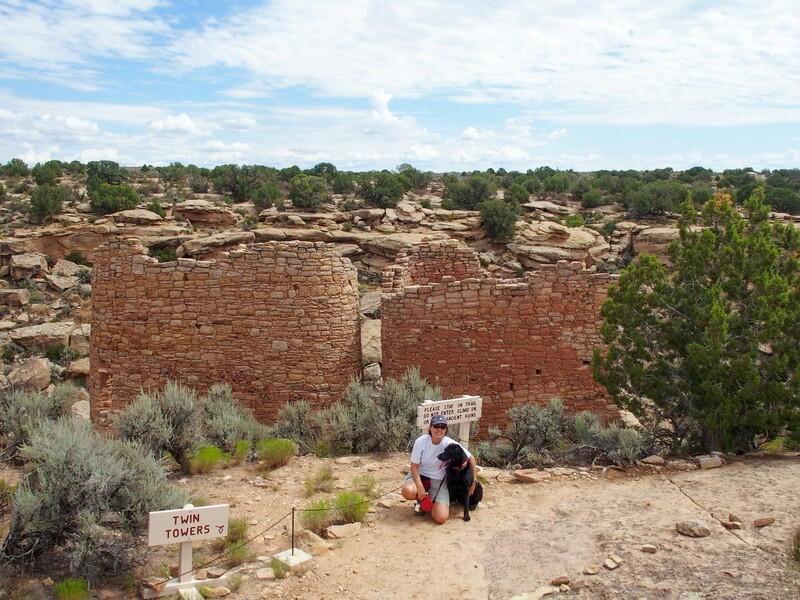 We explored the museum and walked the trail to the nearby Escalante Pueblo sites (photo, above). 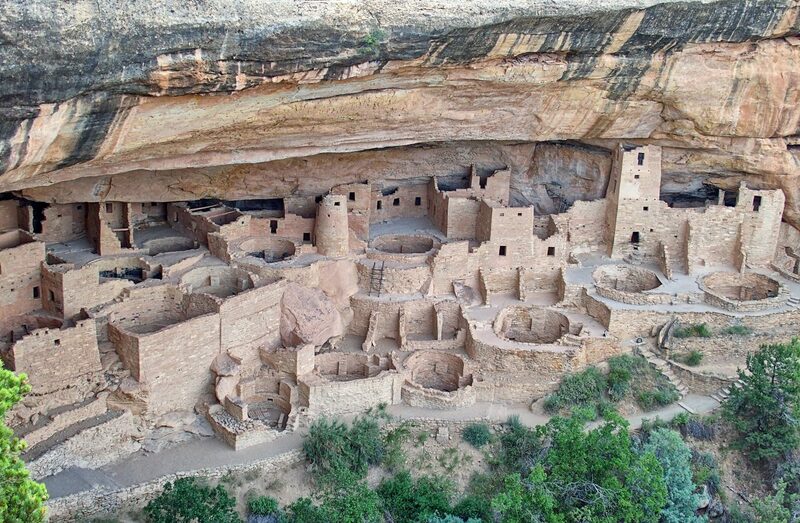 The most famous archeological site in the area is Mesa Verde National Park, less than 10 miles from Cortez. Mesa Verde comprises an amazing collection of well-preserved ancient Pueblo cliff dwellings. We took the advice of other bloggers and first went to the Colorado Welcome Center in Cortez to purchase tickets ($4 each) for ranger-guided tours of two of the dwellings. The sites are in two distinct areas, each a 40–60 minute drive from the park entrance, so it takes a bit of time to get around once you’re in the park. Our first tour was of Cliff Palace (photo, above). 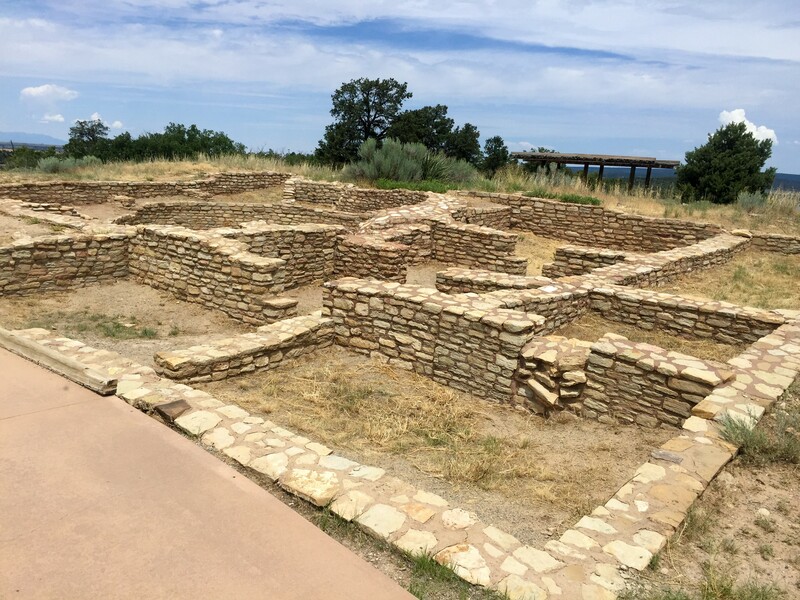 This small city was built 800 years ago when the Pueblo mysteriously relocated their homes from pit dwellings on top of the mesa to stone structures protected by the cliffs below the mesa. 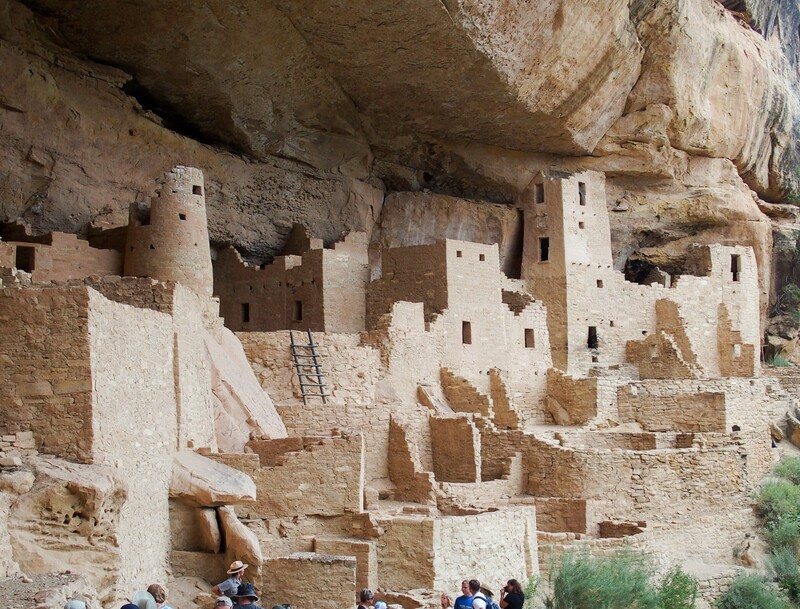 Cliff Palace was home to 100-120 people, though thousands lived throughout the various dwellings in the area. Our ranger-guided tour took our group of 50 or so down into the dwelling, reminding us not to touch, walk, lean, or sit on any of the walls or other parts of the sites. It was amazing to see the impressive stone-work up close, and imagine life here under the cliff 800 years ago. Our guide provided great information about the architecture and history of the ancestral Puebloans. After admiring Cliff Palace we made a short drive to our next tour at Balcony House. Balcony House was a well-protected home with only one way in, through a long narrow tunnel allowing only one person at a time. Fortunately, the National Park Service in the 1930s erected a 30+ foot ladder to make access easier, so that’s how our tour entered the site (photo, above). Once inside we were able to walk through the entire site and see many of its 38 rooms. 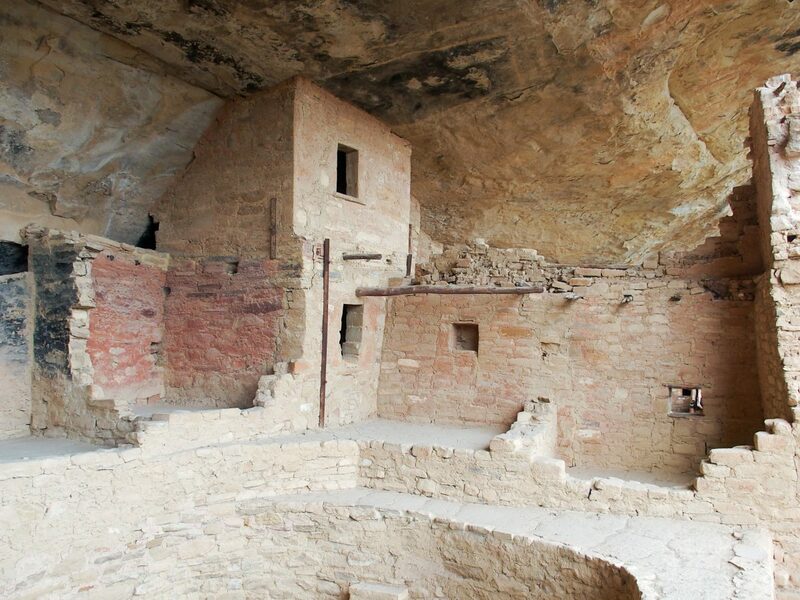 Balcony House is the best-preserved site at Mesa Verde, with many rooms and their outdoor balconies fully intact. We heard more history and learned more about the architecture from our second tour guide, helping to fill out our understanding of the area. 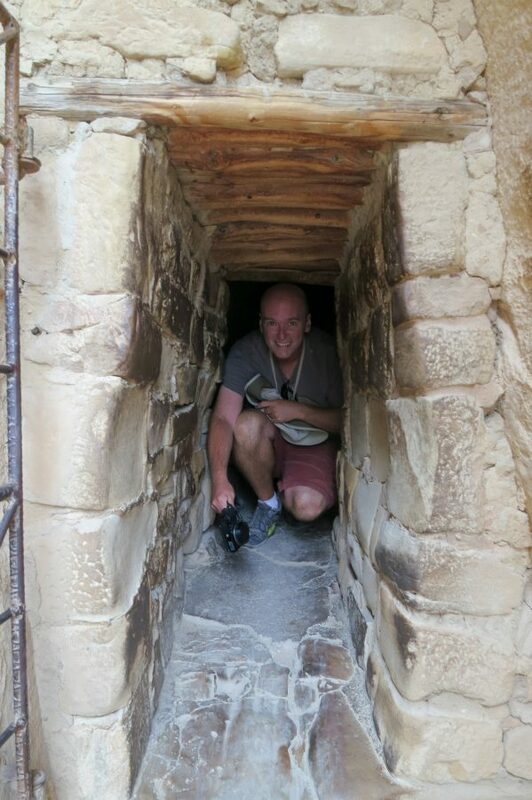 Our exit from Balcony House was the tunnel mentioned earlier… a bit of a tight squeeze for some! 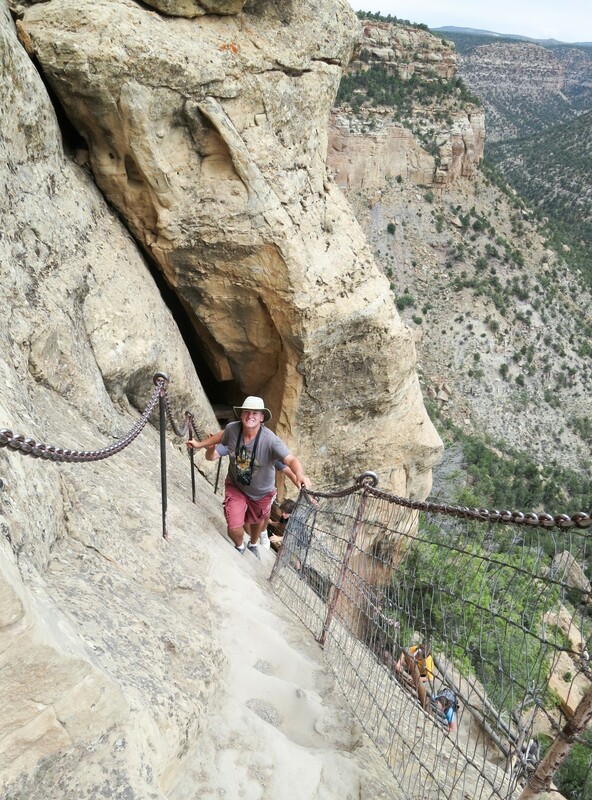 After making it through the tunnel we had to scale a steep cliff face to get back on top of the mesa. Fortunately we had a handrail to hold on to! …and up the cliff face! 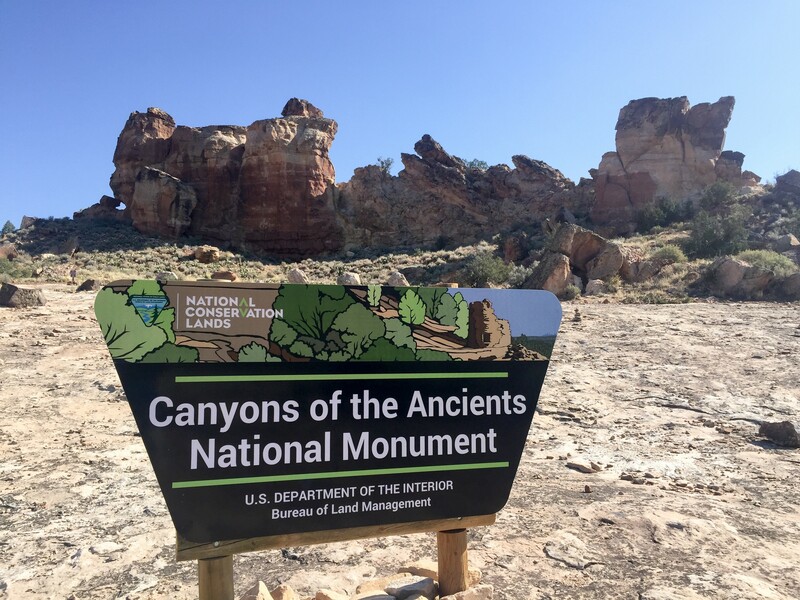 The next day, with Opie in need of a good “dog day out”, we found a recommended dog-friendly hike at Canyons of the Ancients National Monument about 30-minutes west of Cortez. This national monument covers an enormous area: 171,000 acres. It contains more than 6,000 recorded archeological sites, with an estimated 20,000+ total likely sites. Small dwelling in a sheltered cave. 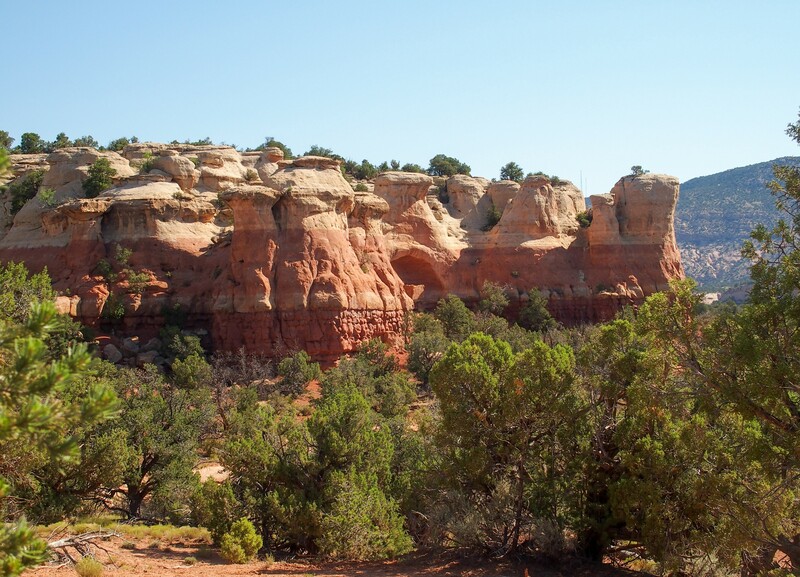 We hiked the Sand Canyon trail which passes near the remains of many ancient dwellings. Some were fairly intact, others were merely the outlines of walls that once were part of larger buildings. The geologic features of the hike were reminiscent of Bryce Canyon’s hoodoos, just on a smaller scale. Although we got a pretty early start, most of the hike was in direct sun and the heat wave was still in full force so we didn’t get to explore as far as we’d hoped. Kathie and I could have handled a longer hike, but Opie in his black fur coat was feeling the heat. He was going through our supply of drinking water much faster than expected, so we turned around before reaching two miles. Better safe than sorry! 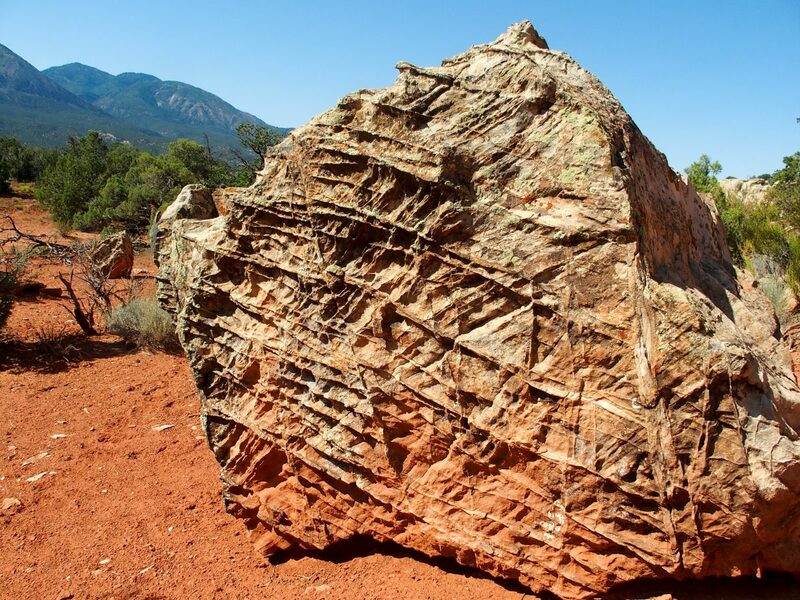 At our turn-around point we spotted an interesting looking boulder near the path, and immediately recognized the strange patterns as “boxwork”. 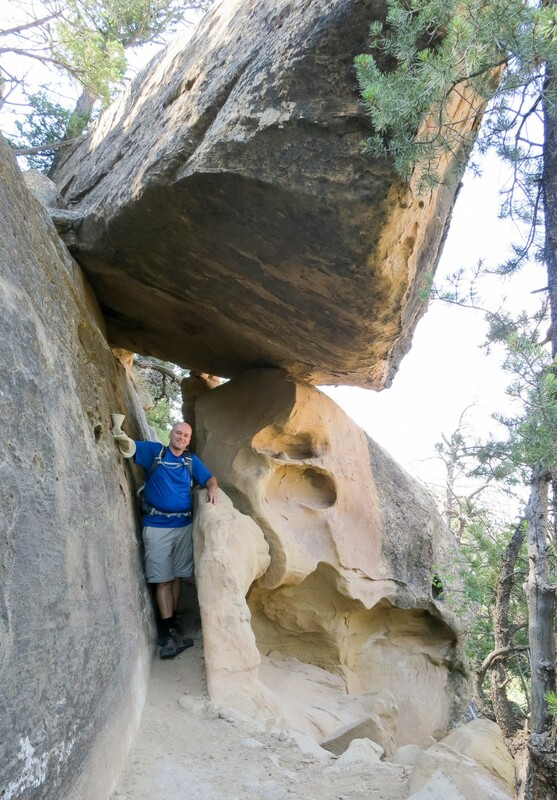 We learned about boxwork at Wind Cave National Park during our visit to Custer SD in 2015. In our Custer blog post you can see nearly identical formations! 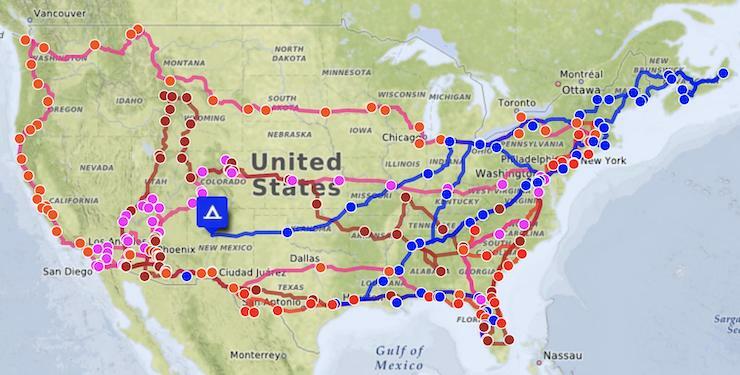 As we explore the U.S. it’s fascinating to see little pieces of a big puzzle slowly coming into focus. 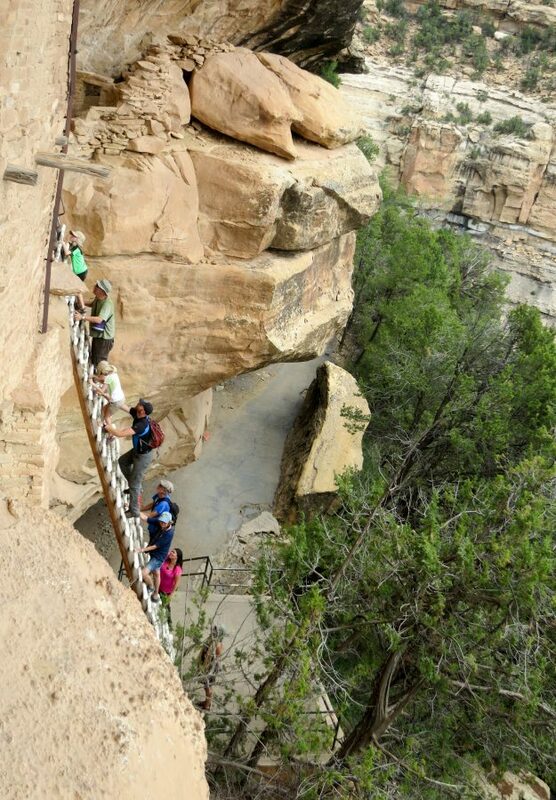 Next we headed back into Mesa Verde National Park to hike the Petroglyph Point loop trail. 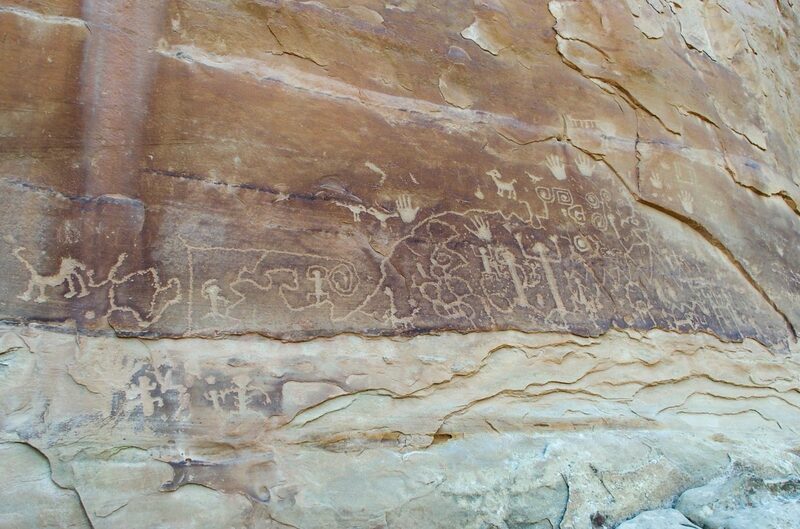 About halfway along the 2.5 mile loop we spotted the petroglyphs etched into the cliff wall (photo, above). Our self-guided tour booklet (50 cents at the trailhead) explained the generally accepted translation, showing one clan separating and wandering away from their original clan until finally settling in a new location. 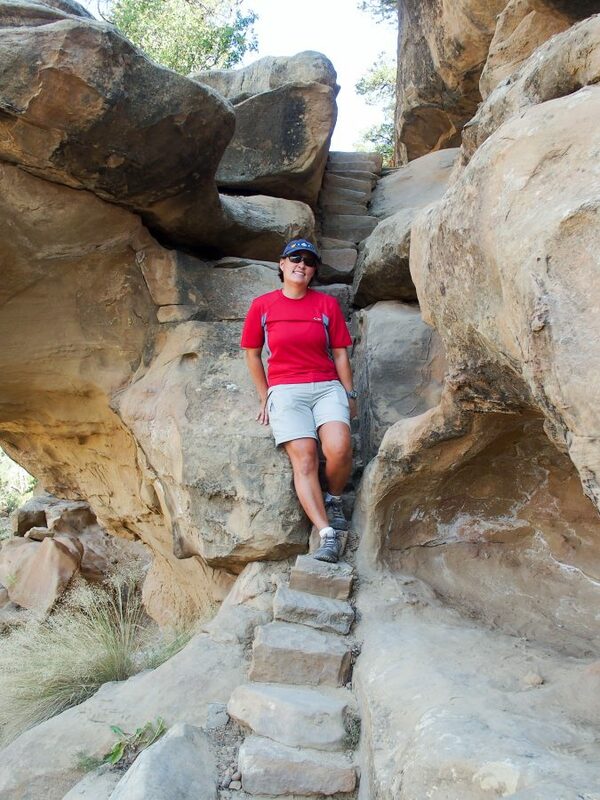 The trail was surprisingly rugged, with quite a bit of climbing steep and narrow rock staircases, squeezing through narrow slots, and occasionally pausing to figure out where to go next. This made it much more enjoyable for us than a typical flat and easy trail. Better yet, the entire first half of the trail (along the cliffside) was shaded in the morning, keeping us cool and happy. The second half of the trail ascended to the top of the mesa and headed straight back to the trailhead, and while it was in full sun, it was also much quicker than the first half so the heat wasn’t a problem. 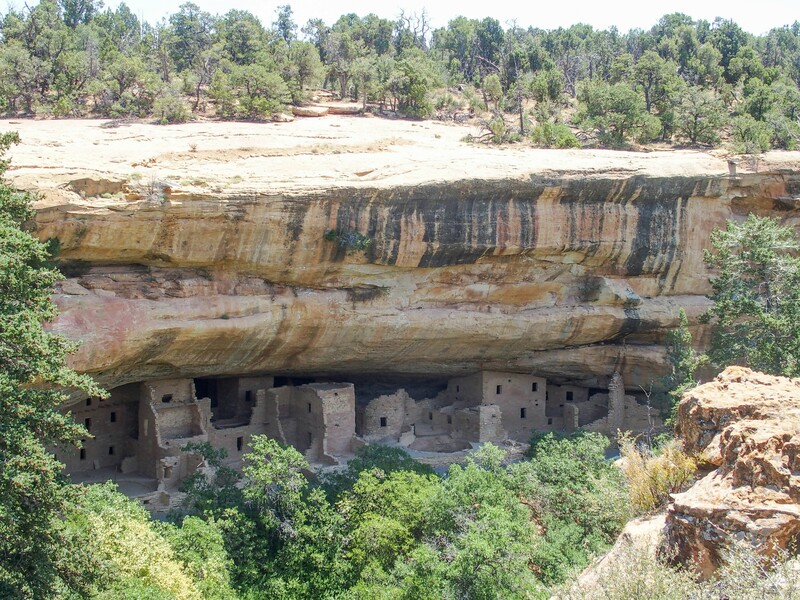 Spruce Tree House cliff dwellings were easily visible from the trailhead, giving a feel for just how extensive these dwellings were and how large the society was that lived here. Did I mention that there’s an almost unlimited number of Pueblo archeological sites to visit in this part of the country? 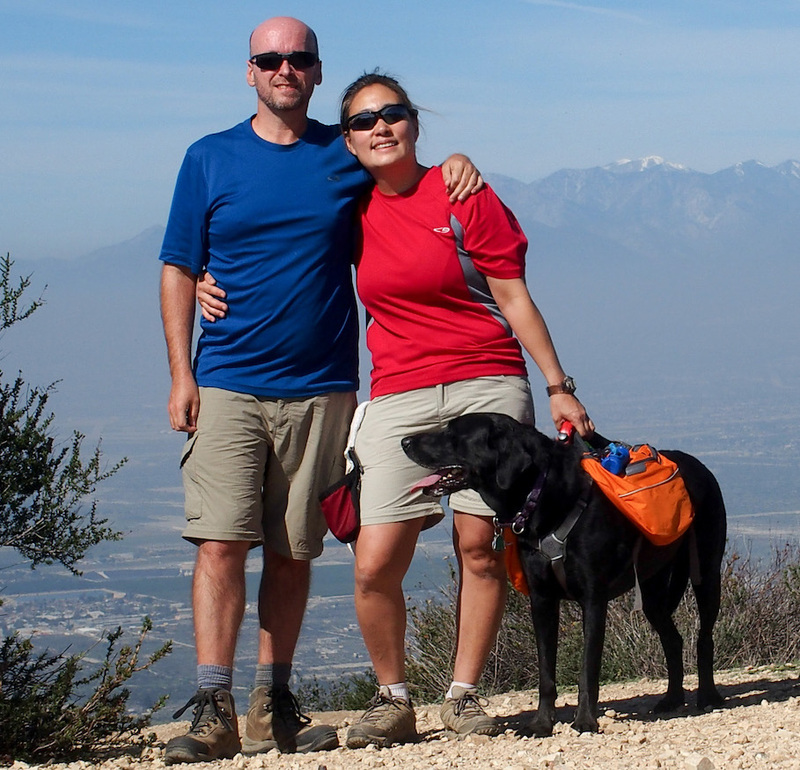 Next up was another dog-friendly hike at Hovenweep National Monument. 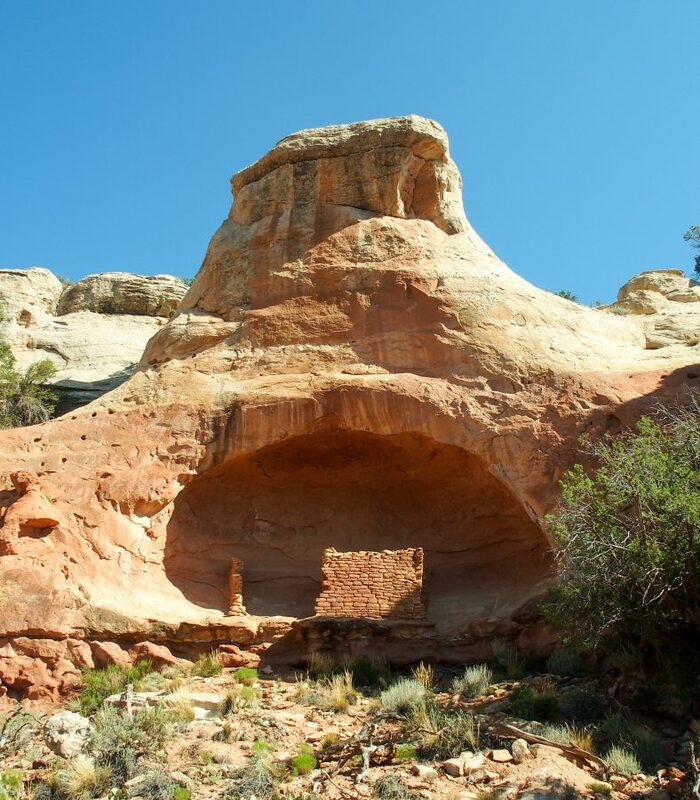 This is a small national monument just across the border in Utah. From Cortez it was about an hour’s drive, mostly along small country farm roads with us rarely seeing another car. 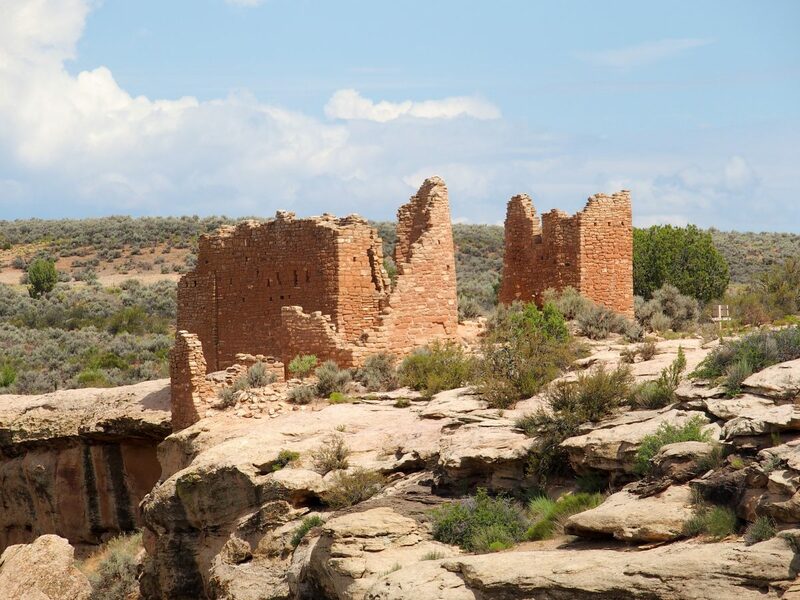 Although there are other archeological sites within Hovenweep, the main attraction is the Little Ruin Trail. 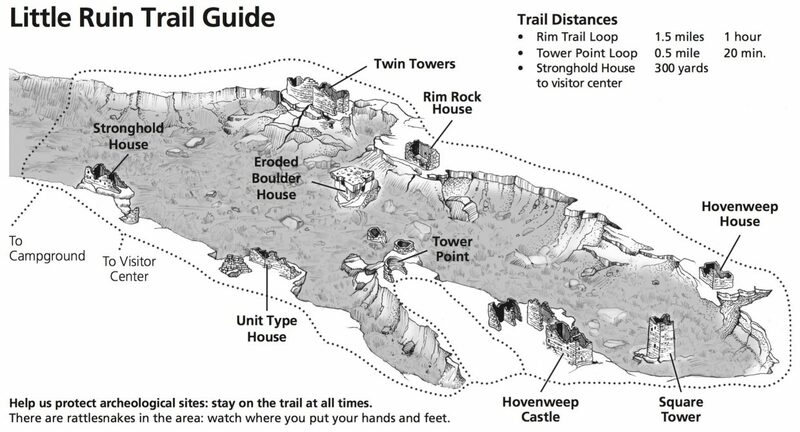 This easy 1.5 mile loop visits the remains of many ancient dwellings. The self-guided tour booklet available at the visitor center provides some great background on each of the ruins, as well as more history of the area and the people who lived here. 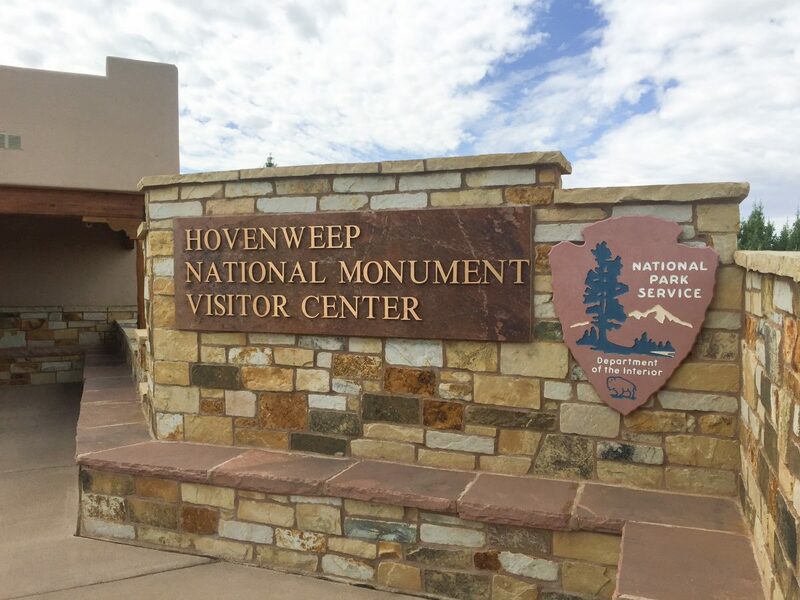 Although Hovenweep definitely qualifies as an “out of the way” place to visit, we’re glad we made the drive to check it out! We found so much to do in the Cortez area that we decided to break it up into two blog posts, so stay tuned for “Part 2”! Ya know, I never thought I had a fear of heights until I started looking at your photos… my lord… the ladder on the side of the mountain? 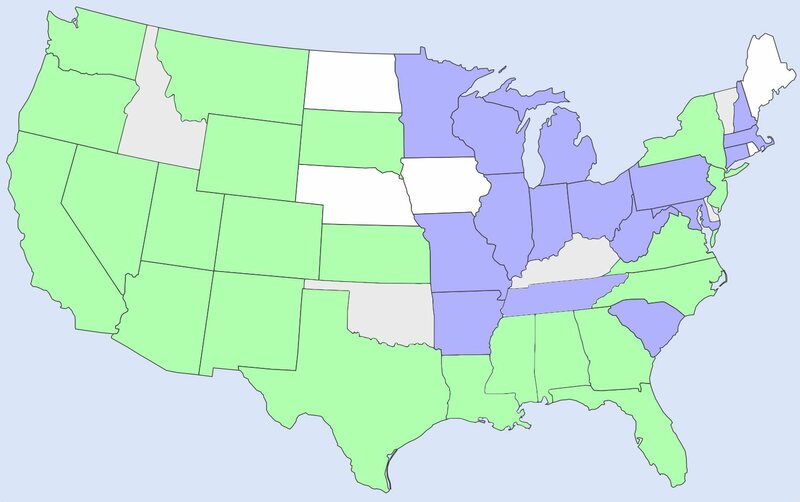 Yikes…. That is no joke…. Wow. Yeah some of these heights will wake you up a bit, but I’m happy to report my fear of heights has been getting gradually better since we started RV’ing. Just a few days ago for the first time I looked down while standing on one of those metal grating bridges over a river far below! It made me dizzy to look, but I didn’t feel as freaked out as I would have in the past… I guess doing it more and more often makes it easier! We stayed at Hovenweep several years ago and loved the campground and the hiking. 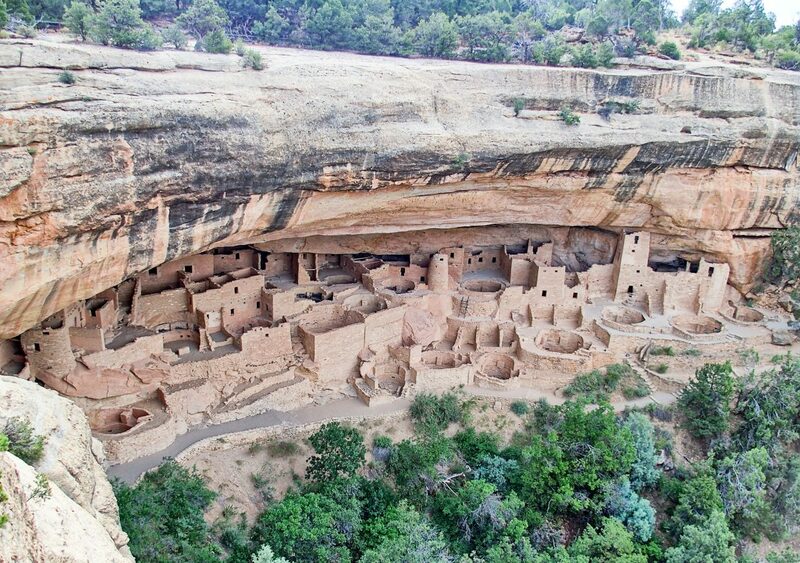 I think your photos of Mesa Verde are among the best I’ve ever seen! It’s been many years since we’ve been there, but now I want to return after reading your post. Thanks for the photos compliment! It’s tricky to time it right so there aren’t dozens of other tourists in each photo. We were surprised at how much there was to see and do within an hour of Cortez, and we still missed quite a few things so we’ll have to return some day as well!